Scenocosme use interactive art, music, and architecture to create evolutionary and interactive artwork. With multiple forms of expression, they invite the spectator to participate in the center of collective musical or choreographic performances. SphèrAléas is made of a half-spherical structure and an evolutionary device for producing visual and sonorous shapes. 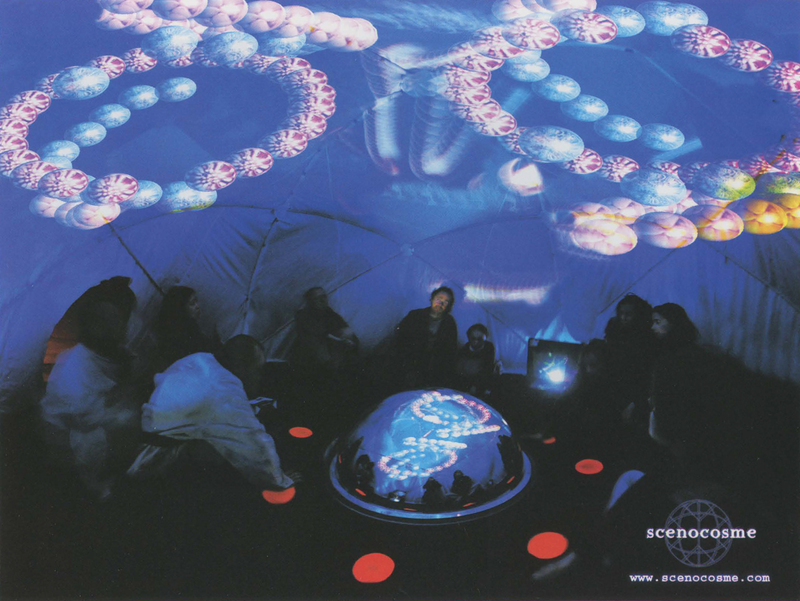 This space is ideal for collective performances; it accommodates in its center a constellation of visible shapes, spinning sound loops, and luminous vibratory elements. The dome-bubble hosts universes and objects endowed with life. They are articulated as subtle microcosms in conversation. Visitors become actively engaged in this matrix space and create sonorous and visual interstices that awaken their senses and open unexpected territories to their imaginations. Visitors (creators) are offered ephemeral face-to-face opportunities for dialogue, and they give themselves up to this sensitive complicity, cradled by flows of random emotions. The show is ever changing. swirls. The audience determines the future of the work by experimenting with infinite orchestrations.